Large no-smell filter for diesel fuel with connections for D 25 mm hose. Large no-smell filter for diesel fuel with connections for D 16 mm hose. Large no-smell filter for diesel fuel with connections for D 19 mm hose. The TWINLINEB extraction ventilator: more compact and more powerful at the same time! 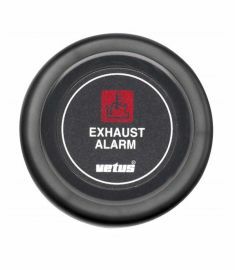 This new in-line extraction ventilator from VETUS has a 25% higher capacity than the 76mm version. With an output of 7m3 per minute, every space can be fully ventilated in no time. The TWINLINEB is rated ‘ignition protected’ so that even the engine room or spaces where combustible gases are stored can safely be ventilated before starting up other equipment! 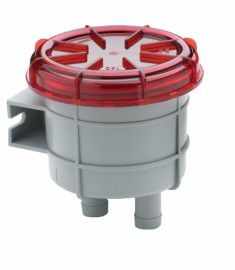 In addition, this powerful ventilator has a very compact housing allowing installation in the most confined spaces. 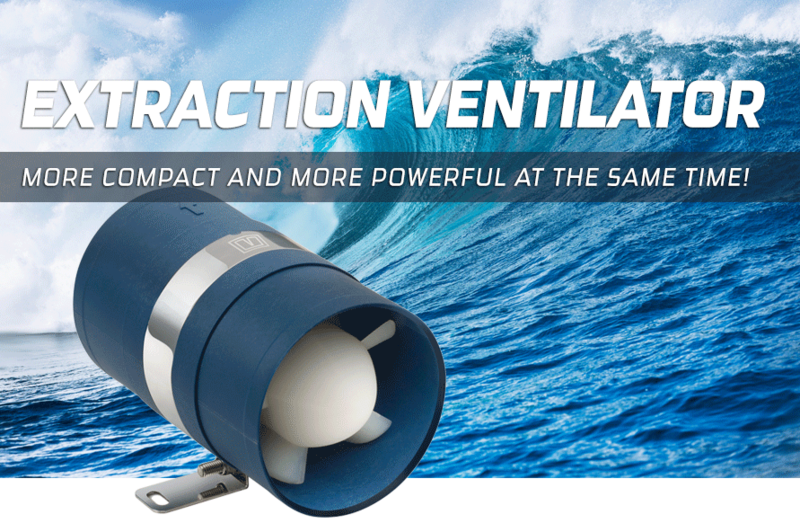 A versatile ventilator suitable for a wide variety of applications! VETUS is proud to present their completely new range of marine diesel generator sets. These new GX generator sets are both reliable and easy to maintain. They are also exceptionally quiet due to the use of the innovative VETUS M-Line engines. These GX generator sets operate at fixed engine speeds. Low speed (1500 rpm) generator sets are recommended for commercial applications, prolonged usage and live-aboard vessels, due to reduced wear rates and lower noise levels. High speed (3000 rpm) generator sets are more suited to leisure applications and make installation possible even in confined spaces, due to their compact dimensions and lower weight. All VETUS marine diesel engines are marinised in-house to meet and exceed the latest standards. They feature specific benefits that are unique to the market. One of the most notable new features of the VETUS M-line engines fitted to sets from 6.5 kVA upwards is the cast aluminium top cover. This cover provides two advantages: reduction of heat and sound. High ambient temperatures in the sound enclosure can have negative effects on engine performance. 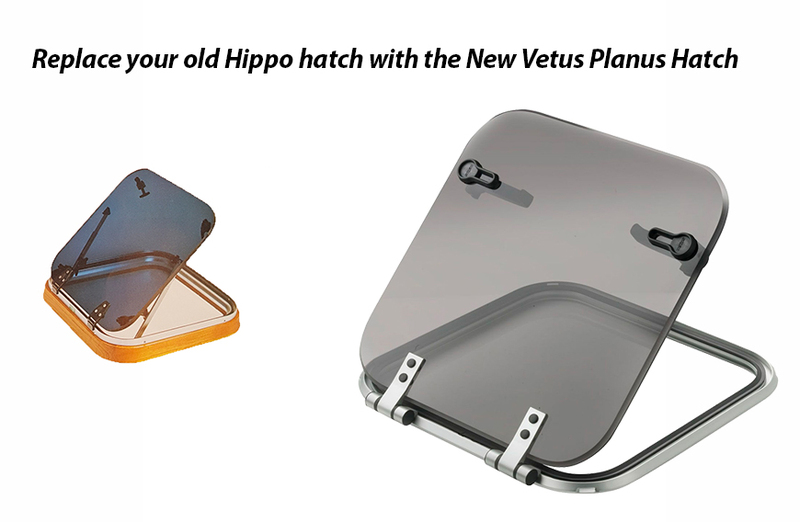 VETUS has developed an elegant yet efficient solution by fitting a water-cooled aluminium engine cover. Located directly above the cylinder head, this huge cooling element absorbs radiant heat coming from the engine. The innovative concept results in a significant temperature reduction of up to 20% and better performance of the generator. 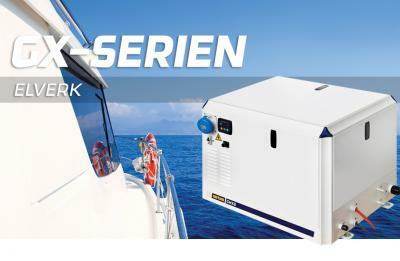 The generators used in the GX generator range are specially designed for marine applications. 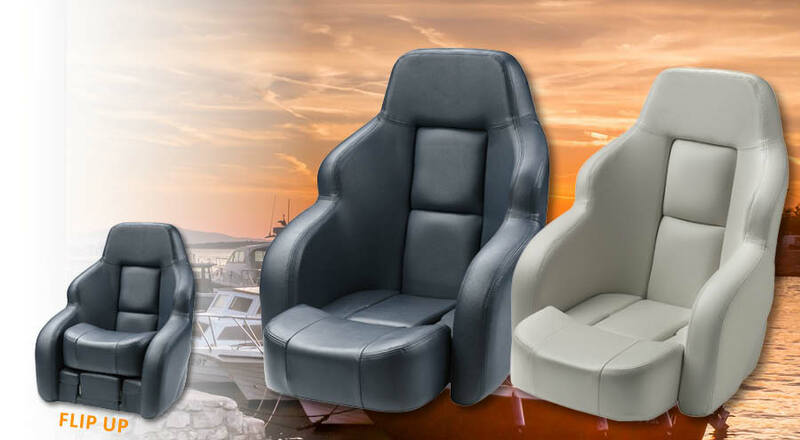 The high quality standard of design, insulation, and finish guarantee a long and reliable life time in the harsh marine environment. These generators have a very clean sine wave ensuring minimal interference with sensitive electrical equipment on board, such as air conditioning and computers. 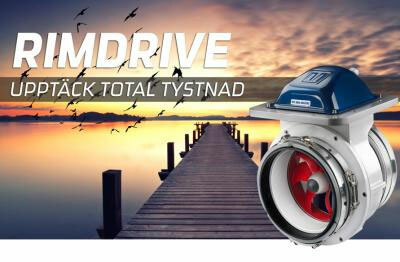 The RIMDRIVE, the silent thruster! Do you want a thruster that you cannot hear? The latest innovation from VETUS makes this possible! There are two main reasons why the Rimdrive is silent. Firstly, the propeller forms the rotating part of the electric permanent magnet motor and therefore noisy gears are not used in this design. Secondly, a ring mounted around the propeller, prevents the propeller tips from cutting through the water. In other words, it prevents cavitation and noise! 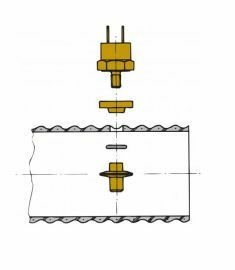 The proportional speed control also helps to prevent cavitation. In contrast with conventional thrusters, the electric motor does not take up much valuable space inside the boat. The propeller forms the rotating part of the electric motor (rotor) and the fixed winding (stator) is mounted in the tunnel. 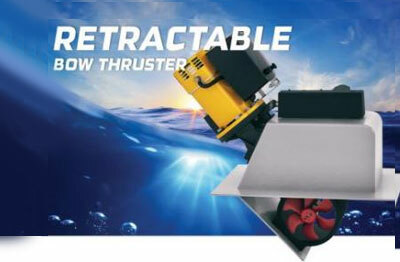 This results in a very compact and self-contained thruster. The motor control circuitry is mounted on top of the thruster with the significant advantage of being cooled by water in the tunnel. Maintaining a constant temperature in this circuitry is vital for the proper operation of the motor. The Rimdrive features proportional control as standard. This means that the correct amount of thrust is always available to the helmsman, in order to cope with different manoeuvres and wind conditions. Furthermore, the Rimdrive offers virtually unlimited runtime, with the only limitation being the capacity of the battery bank. 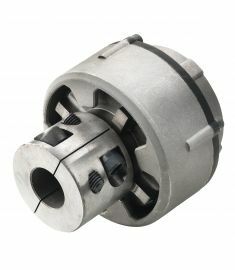 The RIMDRIVE is available with thrust outputs of 125 or 160 kgf and requires a supply voltage of 48 Volts DC. This 48VDC can either be delivered by a 110/230VAC to 48VDC charger or by converting the normal 12 or 24V battery supply voltage by a DC to DC converter solution. 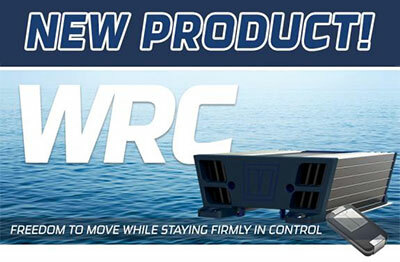 VETUS adds a remote for thrusters and winches to the line-up: the WRC! With the WRC wireless remote control unit you have total control over your boat, right in the palm of your hand. The set consists of a receiver (WRC) and remote control (WRCKF). 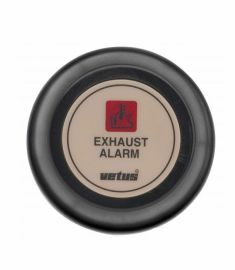 The VETUS wireless control hand held remote has a range of 10 to 25 metres depending on the location of the receiver. 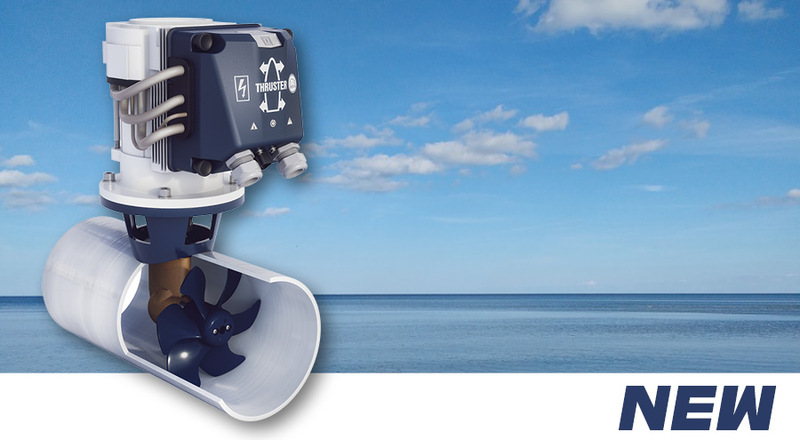 This ensures easy control of bow thruster, stern thruster and/or windlasses, everywhere on your boat. You can programm up to two different items mentioned on the 4-channel remote. The WRC is competitively priced compared to the competition. For safety reasons VETUS recommends to install one fixed control panel like the BPAS next to the WRC. The WRC meets with EMC requirements, has a watertight remote and is directly available from stock. • Power supply: 8 - 30 Volt D.C. Introducing the next evolution of the D-Line engine range. Lower revolutions, with more power and torque whilst maintaining the famed reliability and durability. The new D-line engines meet the new RCD2013/53/EU emissions regulations and are extremely suitable for power hydraulics on board. Supplied with a CAN bus system with a SAEJ1939 protocol, they also work excellently with NMEA2000 systems on board as well. The new VETUS D-Line engines now feature an innovative water cooled top cover in order to reduce the heat in the engine room and reduce the engine noise of an already near silent engine block. This top cover is even sturdy enough to be used as a step. 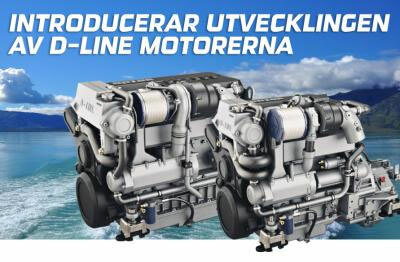 Other features that are added to the new D-Line engines are: a new and smaller air filter in order to save space in the engine room; new exhaust manifold insulation; and water heater connections; an electric sump pump and a high output alternator (160 Amps) as standard. 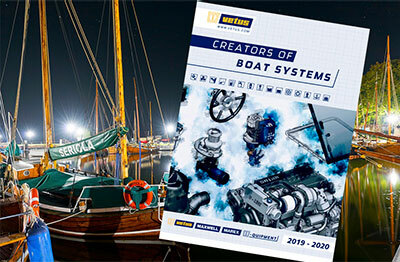 As options Vetus offers a second alternator; a PTO flange to install a hydraulic pump; a fly-bridge instrument panel; a trolling valve and much more. 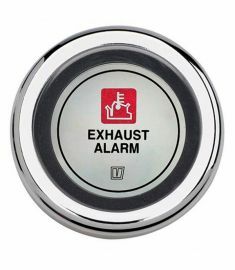 These can be ordered separately but will be installed on the engine when ordered as a complete package. An option exclusively available for the 6-cylinder models is a separate fuel filter kit to meet the requirements of the most demanding customer. 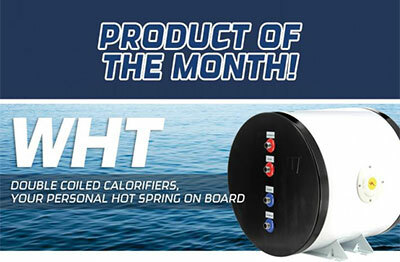 With the WHT calorifier series, VETUS adds a new meaning to ‘Double Dutch’: this twin coiled calorifier range will double your level on comfort on board when it comes to warm water. Another feature next to the double coil is the electric element. The WHT series uses this electric heating element to heat the water when the engine is not running, as alternative to the spiral tube which uses the surplus warmth of the running engine. Warm water at your disposal - anytime, anywhere. The WHT twin coil calorifier series is unique in its (price) class with its additional electric element as standard: an option normally only found on far more expensive calorifiers. 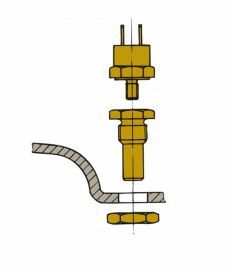 The calorifier is supplied with a complete connection kit: hose pillars, T-shaped connector, check valve and pressure relief valve. Available in four sizes. Please note that the outside dimension on the Old Hippo hatch differ slightly from the new Planus Hatch – se table below. 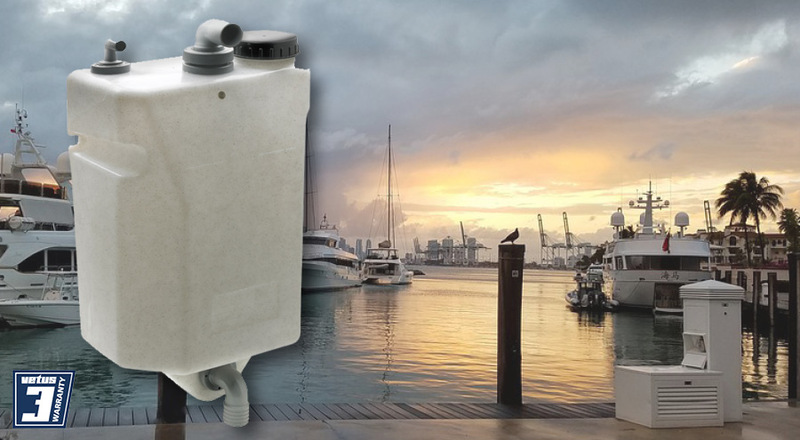 The VETUS family of gas/water separators is extended with a new member; meet the LGS9075! 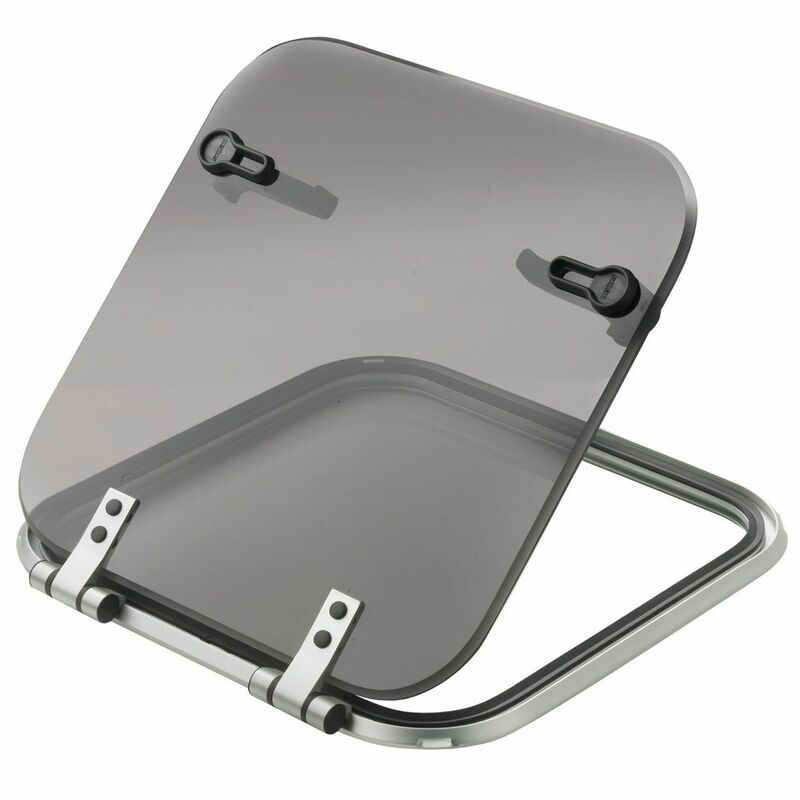 This sturdy separator is engineered to fit larger 91 mm exhaust systems. 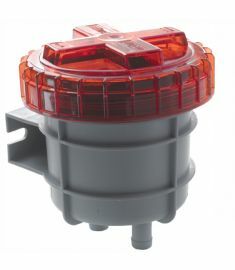 Just like its smaller relatives, this separator is easy to install due to the two 360° rotating hose connections. Mount the separator vertically using the stainless steel bracket and turn the hose connections any way you desire to ensure the best alignment of the hoses. Rotating hose connections ensure easy installation and cause less stress on the hoses itself. 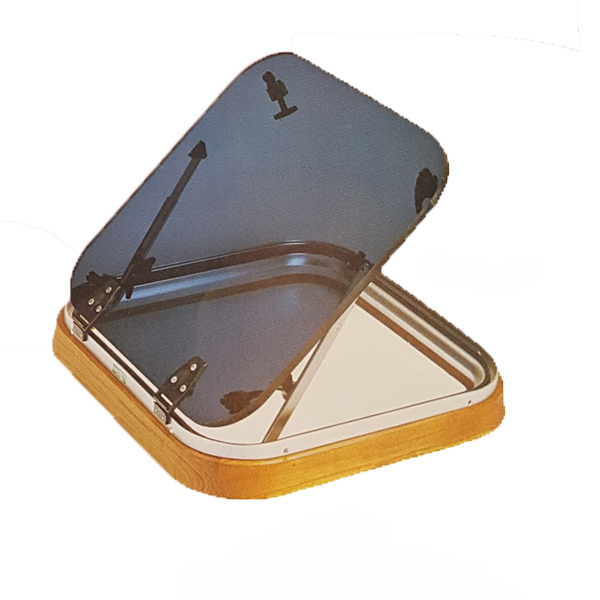 With a 20 litre capacity and a 51 mm connection, this separator is suitable for engines up to 125 hp. 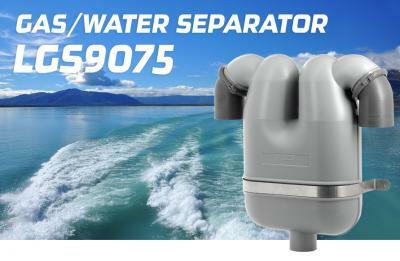 The compact design of the separator makes sure it will fit most boats. The LGS9075 is now available in stores. Even for the more experienced skipper, it can be difficult to maneuver the boat in harsh wind conditions and strong currents. With the new line of retractables from VETUS though, anyone can dock and turn a boat even in the smallest of ports! The latest VETUS innovation - the Retractable - has some big advantages compared to other options in the market. The VETUS Retractable has optimized tunnel ergonomics that will produce more power and less noise and all submerged parts are non-corrosive. 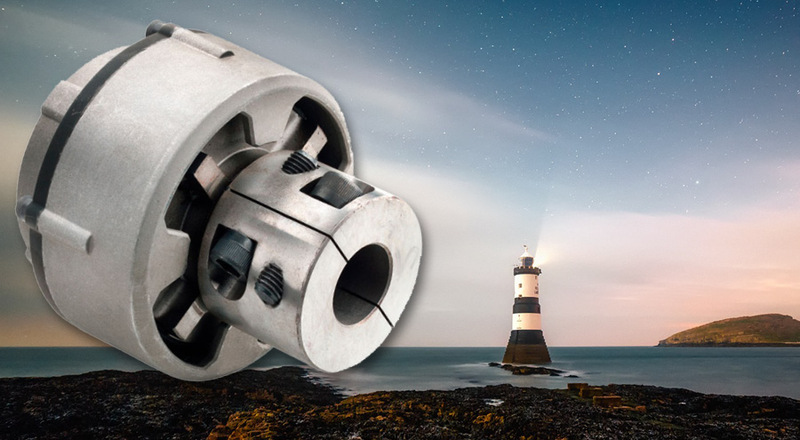 This new thruster has optimal side support for generated forces and unique safety combinations like a thruster start protection, overload and jam protection and a safety pin protection for lid overload. It is electronically prepared for communication based on CAN protocol a less intricate design and has fewer moving parts. The Retractable is light weighted, simple and has a compact robust design that will fit all small possible installation places. For either power or sailboat! 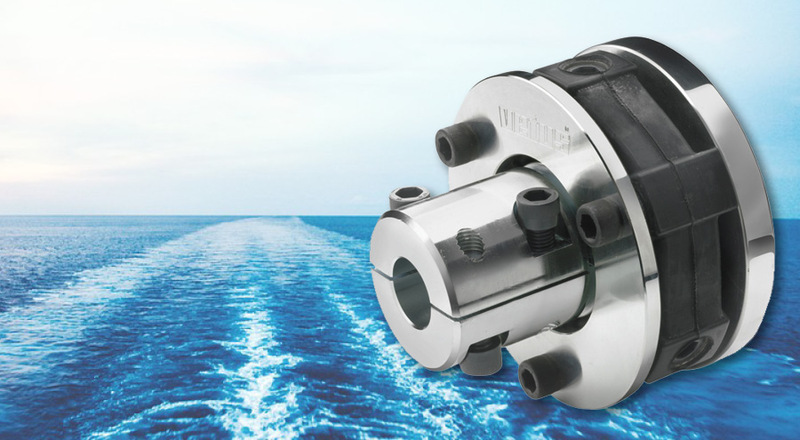 The VETUS line of retractable bow thrusters is suitable for sail or power vessels up to 20 metres. 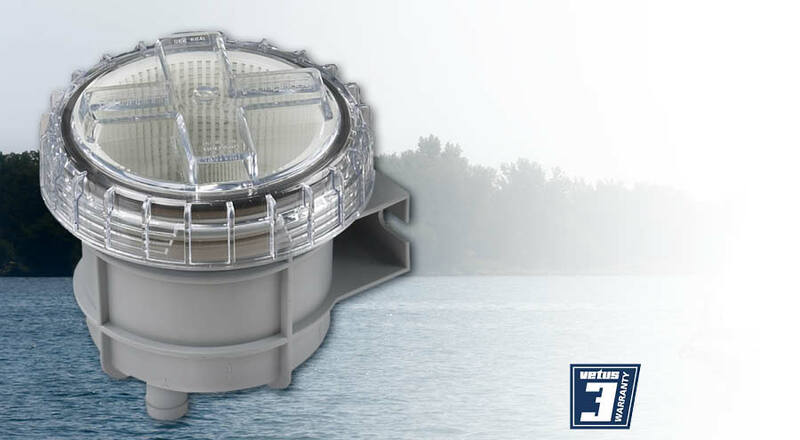 A VETUS bow thruster panel is sold separately and the thruster is available in 150 mm, 185 mm and 250 mm tunnel (diameters). Thrust forces: 55 kgf, 60 kgf, 75 kgf, 95 kgf, 125 kgf, 160 kgf in 12V and 24V.